In this paper, we define the Next Economy and its practical investment application, Next Economy Portfolio Theory. The Next Economy is the unfolding, solutions-driven way we produce and consume goods and services. As systemic risks — climate change, resource scarcity, widening inequality — continue to materialize, demand for solutions is accelerating. As a result, innovative companies addressing systemic risks are leading long-term economic growth, and investing in them is our best opportunity to preserve and create wealth. By directing capital to solutions creators, investors can catalyze and gain from the highly efficient, sustainable Next Economy. A New Definition of Risk. Growing systemic risks — including climate change, resource scarcity and widening inequality — have put the business-as-usual economy in peril. Investors need to rethink their investment decision making process with an eye to these material, long-term risks. Solutions as Economic Drivers. In a rapidly changing world, long-term economic growth will be concentrated among firms finding solutions to these systemic risks. Today, the primary centers of innovation and efficiency — in renewable energy, the Internet of Things (IoT), autonomous transportation and many other applications — are individually and synergistically creating the basis of the Next Economy. 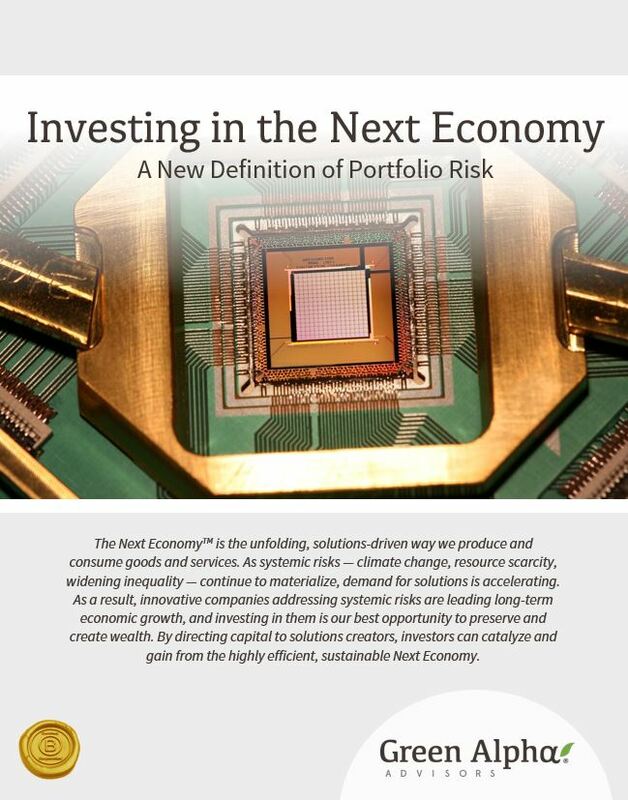 Next Economy Portfolio Theory provides the framework for a solutions-driven investment approach that reduces portfolio risk inherent in the legacy fossil fuels-driven economy, while simultaneously driving capital toward a genuinely sustainable economy.